My kids LOVE painting things. Anything. Seriously, they aren’t picky about what they get to paint. Painting projects aren’t exactly my favourite activity to do with the kids – just because of the mess – but this one isn’t too bad. 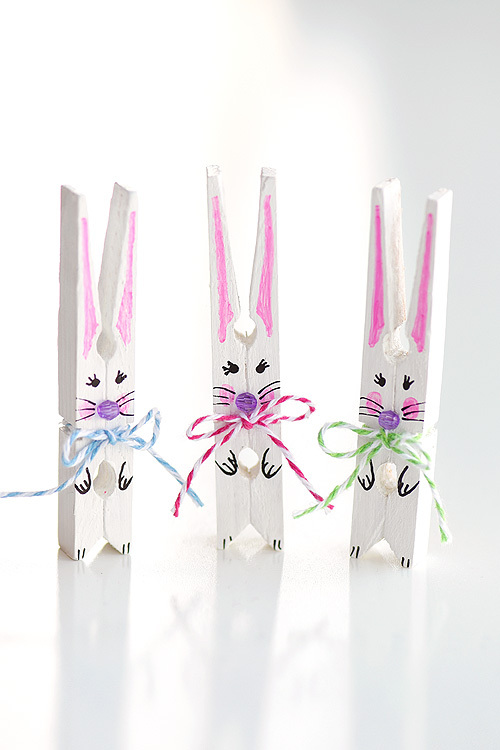 I suppose in all honesty, my kids were at school when I made these clothespin bunnies, so they didn’t actually get to help this time. My older two girls are getting to a much better age for painting, so it’s definitely a lot less messy than it used to be and they would have loved making these! When I’m painting with the kids I’ll pull out our dollar store tablecloth (man… I’d be lost without dollar store tablecloths! ), and I do my best to cover every inch of the kitchen table… sometimes in a double layer… And then I like to give each of my kids a large plastic disposable dinner plate to do all of their painting in. The plastic plates actually do a great job of keeping the messes contained and then you can just toss or recycle them when you’re done. 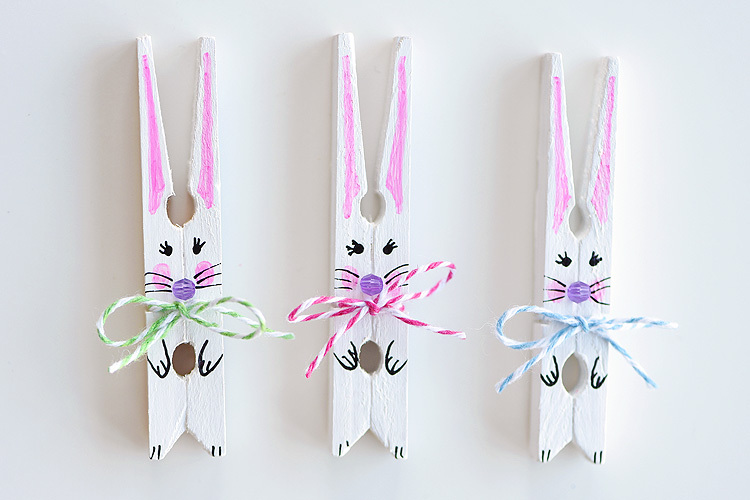 Seriously though, these clothespin bunnies are such a cute craft idea for Easter! They’d be super cute as decorations on the Easter table. 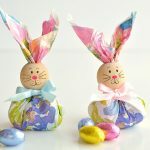 My kids just wanted to play with them as little Easter characters. I’m guessing ours won’t make it all the way until Easter, but if they’re getting played with and the kids are happy, then I’m happy too. 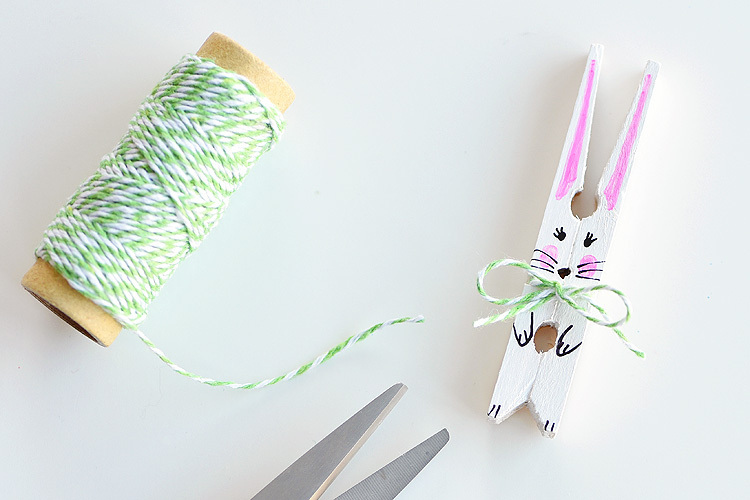 I was inspired by the adorable clothespin bunnies on this page here. I find that acrylic paint from the craft store works much better than acrylic paint from the dollar store. The coverage is so much better! 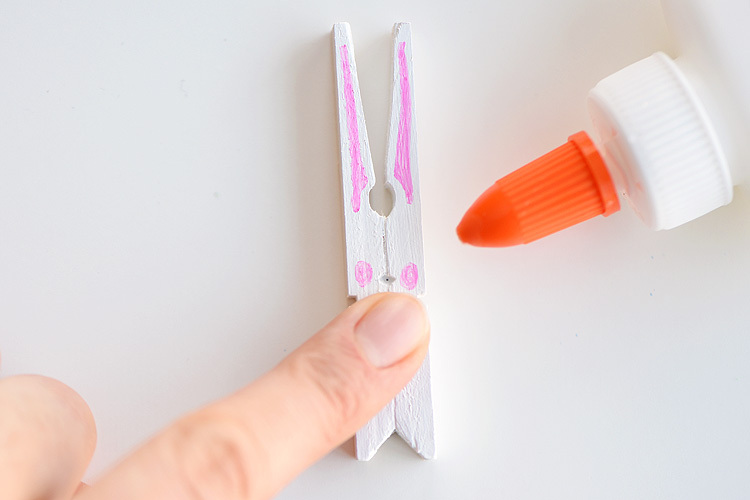 Dollar store paint will work, you’ll just need more coats of paint to get the clothespins white. 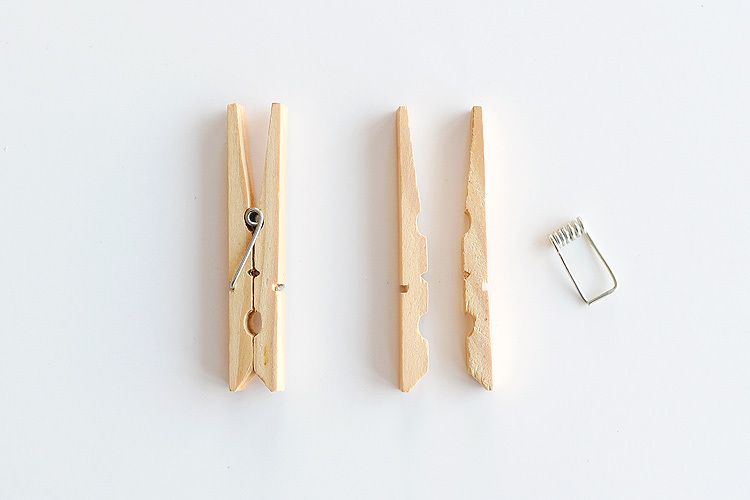 Start by removing the little metal spring thing from the clothespins. 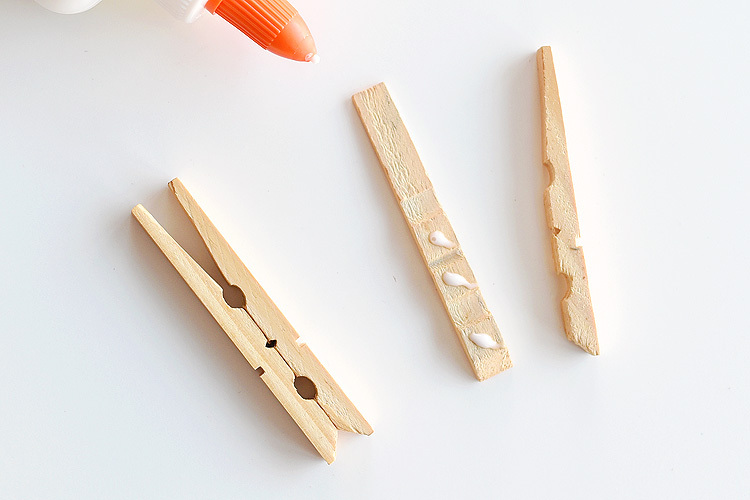 Next add a few small dabs of glue onto the wooden parts of the clothespin that touch each other. Then line up the clothespin and pinch the two pieces together, wiping away any glue that might have oozed out. Let them dry before you paint them. I like to do all of my painting in a plastic dinner plate, especially if I’m painting with the kids. I squeeze the paint right into the plate and let the clothespins dry in the plate too. 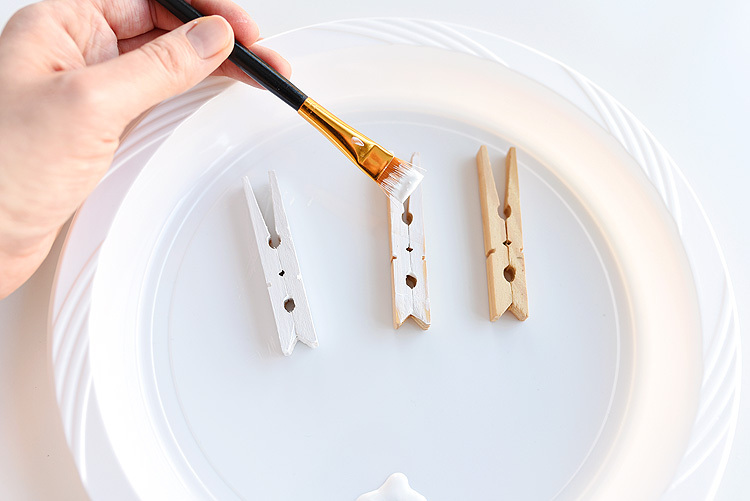 Since it’s plastic, the painted clothespins won’t stick to it and you can just recycle the plate when you’re done. 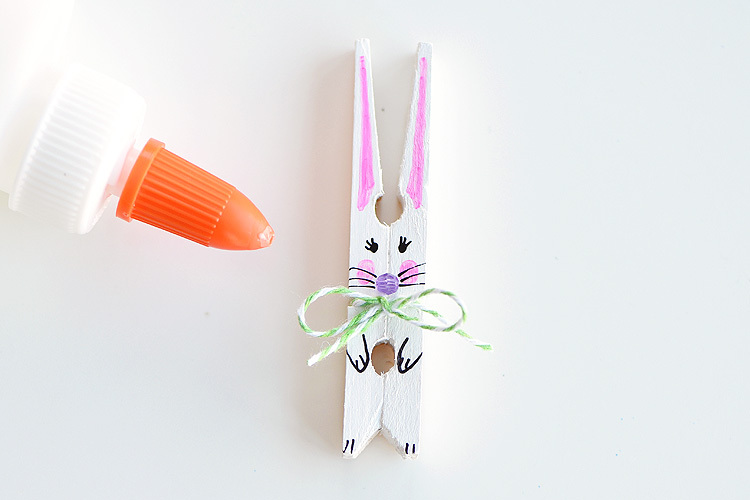 Paint all sides of the clothespins with white paint. My paintbrush couldn’t quite get into those tiny little holes so I dipped a toothpick in the paint and used it to paint the little nooks and crannies of the clothespin. We only needed to do one coat of paint, but it will depend on the type of paint you use. Wait for the paint to dry completely. I waited about 2 hours, but it will depend on the type of paint you used and how much you added. 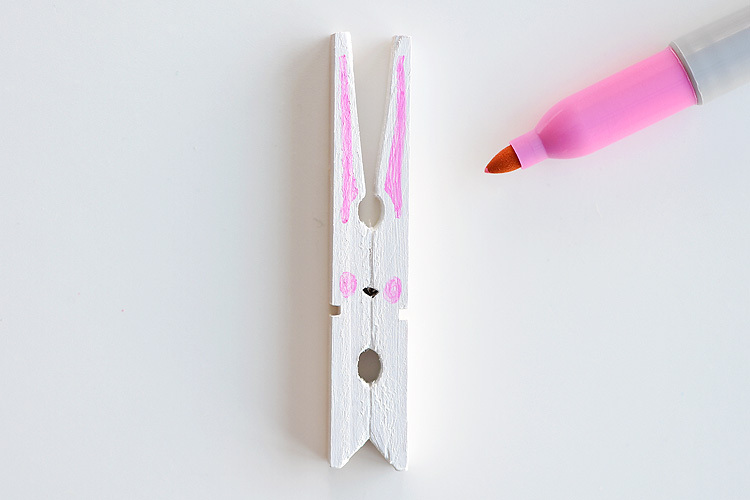 Then use a pink permanent marker to draw ears and little rosy cheeks onto the clothespin like in the photo below. Before you draw the face on with the gel pen, I recommend adding a super thin layer of glue on top of the paint and marker. I just spread it out with my finger. I’m not sure if it’s 100% necessary, but I find that once the glue dries, the gel pen writes much better on the painted surface and the ink is less likely to smear and run. The glue layer should be really thin. By the time I was finished adding glue to all five clothespins, the first one was dry and ready to write on, so you don’t have to wait long. 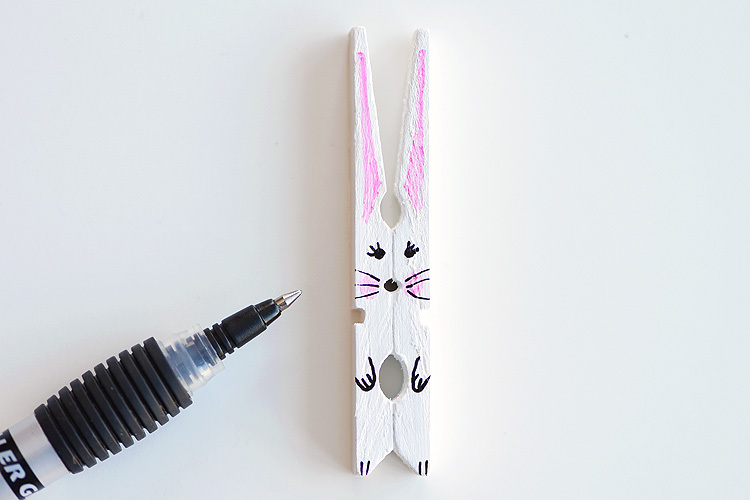 Next, use a black gel pen to create your bunny! I added little dots with eyelashes for the eyes and whiskers over the rosy cheeks. Then I drew little paws and little toes. Make sure you’re really careful not to smudge the wet ink. Once it’s dry it doesn’t smear, but as it’s drying it can really make a mess on your bunny if you accidentally touch it. So either let it dry completely before you move on to the next step or be really really careful as you work. Once the ink is completely dry, cut a small piece of coloured bakers twine, about 8″ long. 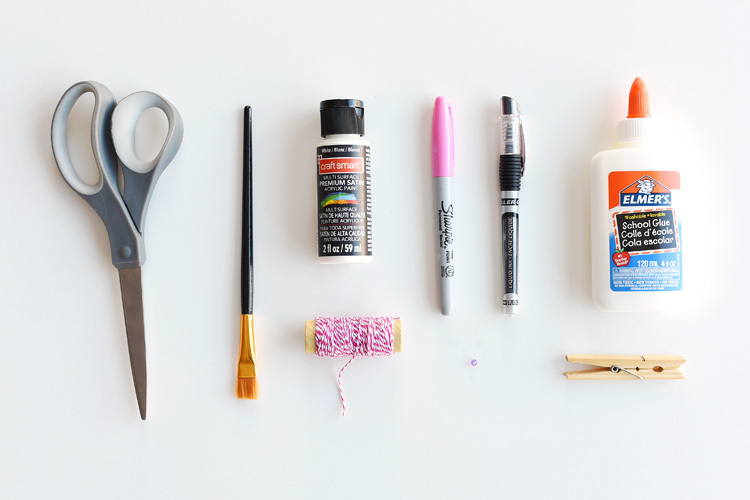 I got my bakers twine from the dollar store and it’s perfect for these sorts of crafts! Ribbon is just a little too bulky for the clothespin. Tie the ribbon around the bunny’s “neck”, which is right inside the little grooves that the metal spring used to sit in. Shape the twine into a small bow and trim the ends. Now look for really small plastic beads to use for the nose. 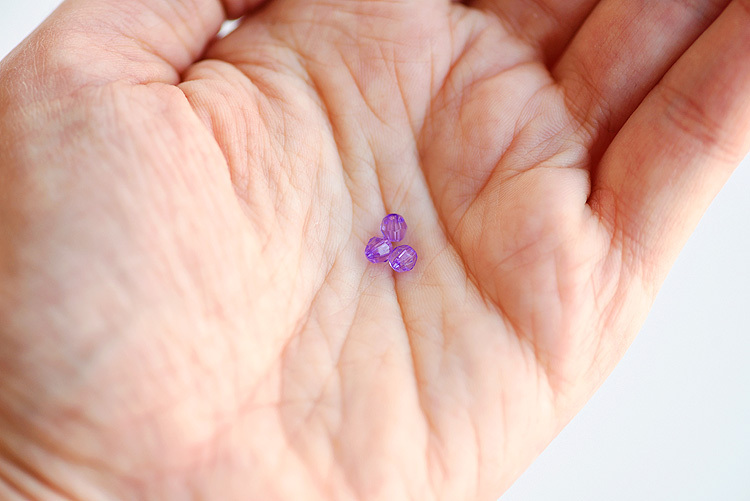 I found these small purple beads in one of the kids craft sets. They’re really small, about 3/8″ wide maybe? My fingers are just too big to be able to get a tiny bead like that in place. I didn’t want to use my good tweezers for crafts, so I ended up poking a toothpick into the hole of the bead, and I used the toothpick to get the bead into place on the small dab of glue. I’m not an artist when it comes to drawing faces so I definitely recommend keeping the face as simple as possible. You could even use googly eyes if you want. My 5 year old loved playing with these! 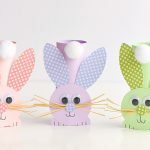 She made a fun little Easter scene with these clothespin bunnies and the cupcake liner flowers we made last week. 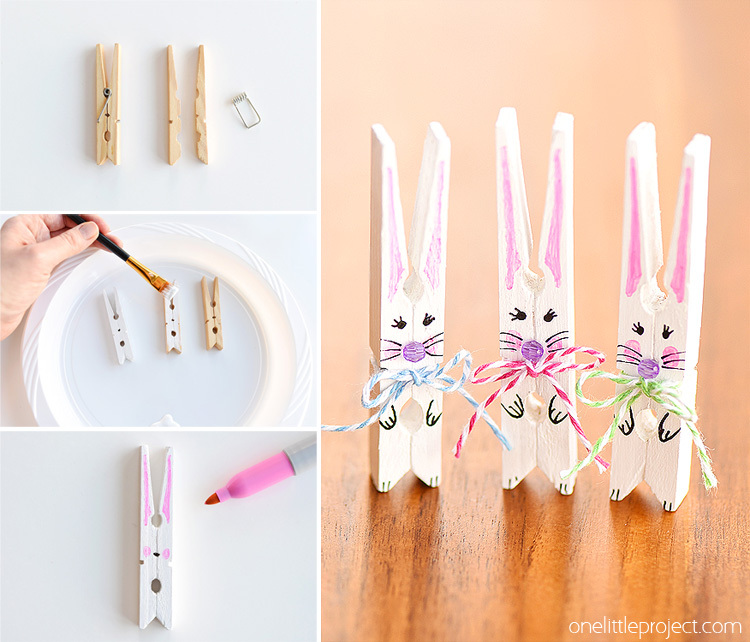 These clothespin bunnies are so adorable and they’re really simple to make. 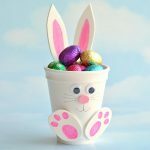 They’re a great little Easter decoration and a super cute Easter craft idea to make with the kids! Remember to set out a dollar store tablecloth and a plastic dinner plate for your kids to paint in, and the clean up will be easy! 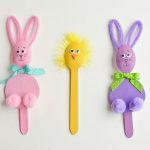 If you’re looking for more adorable clothespin Easter craft ideas check out our Peek-a-boo Clothespin Eggs. I love how the little chick hides inside the egg! Just a hint about your chairs. You could cover them with trash bags while they are painting. Just a hint about your chairs. You could cover them with trash bags when they are painting. 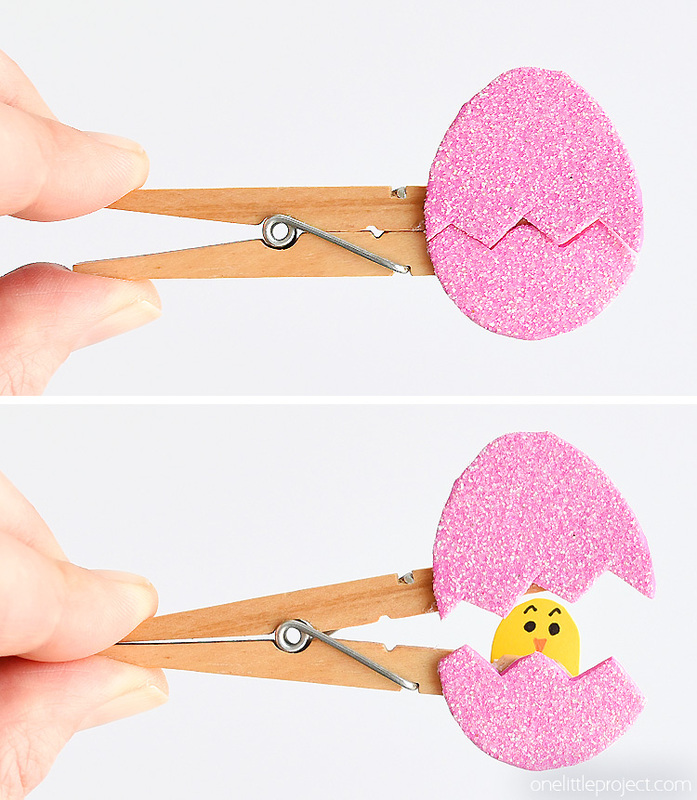 these are really cute, and easy!!! 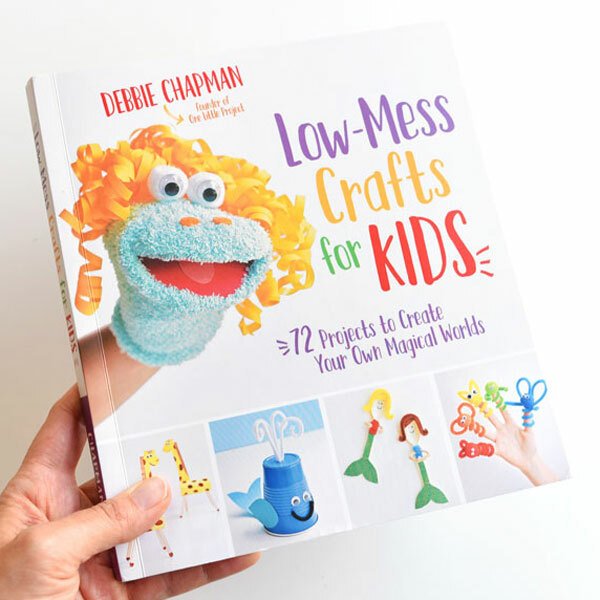 The projects are fun, easy and most importantly low-mess, so the clean up is simple!